GBC UK offer a range of shapes and sizes of inflatable stoppers, suitable for all applications. GBC UK offer a range of shapes and sizes of inflatable stoppers, suitable for all applications. Made from a natural rubber bladder covered in waterproof polyurethane coated nylon to prevent friction and static electricity build up. Cylindrical – These are generally used for blocking pipes where access is restricted. Spherical – These stoppers have less contact area than cylindrical stoppers, and are most suited to applications where access is further limited. Due to its shape the spherical inflatable stopper can be used at any angle. Square / Rectangular – These stoppers have a variety of applications, including in air conditioning ducting and venting. Doughnut – These stoppers require minimal space and are perfectly suited to larger diameter pipes as there is less inflation required. Sausage – The design of this type gives more contact area between the stopper and the pipe wall enabling these stoppers to hold back more pressure. 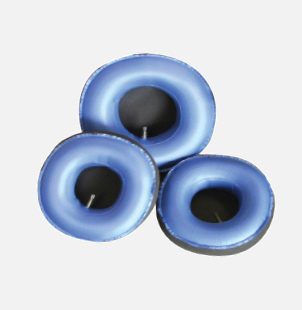 Heat Resistant – These stoppers are made from a specially designed kevlar and nomex mix material to withstand temperatures up to 500°c for applications involving higher temperatures such as pre heating. 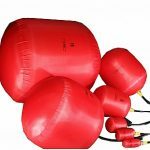 Each inflatable stopper comes with an inflation hose fitted with a schrader valve enabling inflation with a standard airline, bicycle or foot pump.